Cultural History, Famous Painters/Sculptors and Art Museums in the Capital of Northern Ireland. Dawn, by Belfast artist Hans Iten. The city of Belfast (Beal Feirste) is the capital of County Antrim, as well as Northern Ireland's most populous urban area in the province of Ulster and its biggest centre of visual arts and culture. Its recorded history dates back to the tenth century. Among its noted landmarks and cultural institutions are the Northern Ireland Parliament Building at Stormont in East Belfast, the Ulster Museum, Queens University and its Naughton Gallery. It also houses the Northern Ireland Arts Council, the principal agency for the development and advancement of art in Northern Ireland. Its remit for the visual arts extends to: Irish painting, Irish sculpture, printmaking and drawing, installation and public artworks. 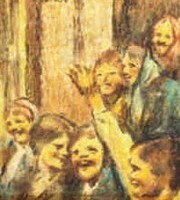 Although visual arts in Belfast have experienced lean times - such as during World War II - painters and sculptors like Gladys McCabe, George Campbell; William Conor; Gerard Dillon; Charles Lamb; Frank McKelvey; Colin Middleton; Daniel O'Neill; Markey Robinson; Kenneth Webb and Maurice C Wilks formed a resolute band of kindred spirits who helped to turn the city into a significant artistic centre. Arts education is provided by the Belfast College of Art (formerly the Government School of Design). Previous students have included a glittering array of famous Belfast artists including William Conor, Gerard Dillon, Dan O'Neill, George Campbell and Arthur Armstrong. In addition a wide range of Art courses are available at the University of Ulster's Faculty of Art and Design. The Royal Ulster Academy of Arts (formerly the Belfast Art Society) remains the foremost artists' organization in Northern Ireland. Many of Ireland's most outstanding artists are exhibiting members of the Academy. Among its founding Academicians were the painters Mildred Anne Butler, William Conor, Hans Iten, Frank McKelvey and Charles Lamb. Other prominent artists who became members of the RUA include such luminaries as Tom Carr, Colin Davidson, TP Flanagan, Gladys MacCabe, Cecil Maguire, Leo Whelan (HRUA), Maurice C. Wilks. Also centred in Belfast is the Ulster Watercolour Society, which aims to promote and exhibit watercolour, gouache or line and wash artworks throughout Ulster and to support watercolour painters of all ages. The Ulster Museum, currently undergoing renovation, is the preeminent public arts institution in Belfast. It is renowned for its displays of Irish antiquities, Ulster history, paintings and sculpture. Its Fine Art Collection includes portrait paintings by Thomas Gainsborough and Sir Joshua Reynolds; landscape masterpieces by J.M.W. Turner; a collection of Old Masters featuring pictures by Dutch, Flemish and Italian Old Masters, and a large collection of Irish artworks by artists like James Arthur O'Connor, the Impressionist Roderic O'Conor, Walter Osborne, John Lavery, John Luke and William Conor. The Naughton Gallery at Queen's is the newest and most exciting arts space in Belfast. Along with Queen's Film Theatre and the annual Belfast Festival, it forms part of the university's Culture and Arts Division. Other Belfast art venues include: the Ormeau Baths Gallery (028-90321402); the Tom Caldwell Gallery (028-90661890); Bradbury Gallery (028-9023-3535), Eakin Gallery (028-9066-8522), Emer Gallery (028-9077-8777), Gormley's Fine Art (028-9066-3313), Nicholas Gallery (028-9068-7767), Charles and Gilmore Fine Art Dealers (028-9042-8555), and Flax Art Studios (02890-234300).  For more about visual arts in Ireland, see: Irish Art.  For more about the historical heritage of the 32 counties, see: Homepage.  For a list of the top living painters in Ireland, see: Best Irish Artists/Painters.  For details of art venues in Ireland, see: Irish Art Galleries.